Shared Hosting Evolved! ViUX Shared Cloud uses our state-of-the-Internet Cloud Hosting System for customers to “Share” Distributed Cloud Servers – with tools for getting Websites online in minutes with ease! Starting off with your first Website, Blog or e-Store? Begin small with a Hosting Solution that has all your needs covered! Have a growing Website or multiple Sites to Host? Need lots of Mailboxes for Employees? Virtuozzo® with Ultra-Fast SSD Enhanced Cloud Storage - Performance, Reliability, Dynamic Scalability, Replication & Failover. Plesk Onyx - Complete management and control at your fingertips... Web Applications, Websites, Email, etc... All with ease! Business Quality Email with optional Microsoft® Exchange ActivSync, plus Cyren® Premium Antispam / Zero-Hour Antivirus. Start near the finish line - Build your Website online in minutes with drag & drop simplicity, professional templates, and powerful modules. Wordpress, Drupal, Joomla, DotNetNuke, PinnacleCart, etc... Fast & Easy 1-Click Install of many popular Web Applications via Plesk. Fast & Easy, Private & Secure - Share Files of any size from your Desktop or Email using File Sharing in Plesk and/or SmarterMail. SSL/TLS Encrypted Email, plus several layers of Web Application Security built-in to protect your Website, Email & Private Data. Web Analitics & Log Reporting on demand via SmarterStats, AWStats, Webalizer, or Google Analitics - Know Your Website Visitors! Help is never more than a click or call away - Chat Live anytime or Email / Submit a Ticket for EXPERT Website & Hosting Support. Linux or Windows Hosting, Why Should I Choose? Linux is the most common Operating Syatem for webhostung that hosts a variety of services and programming languages like PHP, mySQL, Java, etc. Most Common applications are WordPress, Joomla, Drupal, Magento that require Linux. Windows, the most popular Operating System, in the world of web hosting, is primarily used for specific programming languages like ASP, .NET, MSSQL, etc. Most common applications for Windows are DotNetNuke, SmaterMail, etc. Shared Cloud Hosting is different from Private Cloud or Cloud VPS (Virtual Private Servers) and Dedicated Servers, which leaves many users wondering – What exactly is Shared Cloud? ViUX leverages our state-of-the-Internet Cloud Hosting System, based upon Virtuozzo, SSD Enhanced Cloud Storage and Dell Cloud Servers, to provide Shared Cloud Hosting running Linux or Windows Server Operating Systems. We have answered most of the frequently asked question in this section. But if your question has not been sufficiently answered here, feel free to contact us. What is Shared Cloud Hosting? Which should I choose... Xpress or Xtreme? What is Plesk Onyx? 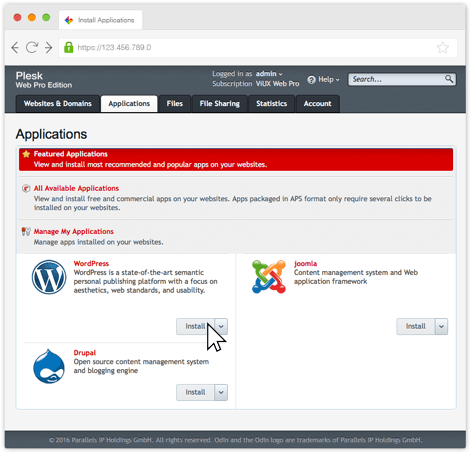 Tools for managing multiple WordPress Installations, Themes, Plugins and Security at your fingertips – using the Plesk Onyx WordPress Toolkit! And much more – at your fingertips! Supercharge your WordPress Websites by combining award winning Web Hosting by ViUX with the best Web Server Software – Plesk Onyx! ViUX has been recongnized as Partner of the Year for 2013-14 (Americas) by Virtuozzo. Shared Hosting on Cloud Servers via Virtuozzo® Cloud Storage… ViUX deploys Shared Cloud Hosting on Cloud Servers using Virtuozzo running on ultra-fast SSD Enhanced Cloud Storage. WEB, DATABASE & EMAIL Services are distributed across separate Cloud Servers using Plesk Onyx for reliable Shared Hosting with dynamic scalability, replication & built-in failover for trouble-free / high-performance Shared Hosting in the Cloud. ViUX Shared Cloud Hosting features Plesk Onyx, a Control Panel supporting a Multi-Server / “Distributed” deployments, splitting WEB, DATABASE & EMAIL services across multiple Cloud Servers within the same Shared Cloud Hosting subscription. This creates a more stable environment when compared to conventional Shared Hosting, where everything is on a single server. Further, Plesk Onyx + Odin® Automation provides a simple consolidated interface for managing all aspects of your Shared Cloud Hosting service – with full customization and control at your fingertips. The Linux-Hybrid and Windows versions of ViUX Shared Cloud Hosting feature the latest version of SmarterMail Enterprise with optional Microsoft® Exchange ActiveSync, plus Cyren® Premium Antispam & Zero-Hour Antivirus. SmarterMail delivers Exchange-level Email service with powerful features like: Instant Messaging; File Sharing; Events & Notifications; Message Archiving; Synchronization with MS-Outlook and Smartphones / Tablets; and much more! WordPress; Drupal; Joomla; DotNetNuke – these and many other popular Web Applications can be installed into your Website(s) easily via the 1-Click Applications install function of Plesk Onyx. Further, ViUX can make the entire Application Packaging Standard (APS Catalog) of Web Applications available for install as 1-Click Applications within Plesk! Who needs Dropbox? ViUX Cloud Hosting offers two File Sharing options… Plesk Onyx provides a File Sharing function, including the ability to Share Files directly from your local computer using a Shared Folder. Further, SmarterMail Enterprise provides an Email based File Sharing function – giving you two options to Share Files both SECURELY and PRIVATELY. Security is paramount to protect you… Not just protection from annoying SPAM, but also protection from Email VIRUSES via Cyren® Premium Antispam & Zero-Hour Antivirus (SmarterMail) or Plesk Premium Antivirus & MagicSpam® (Postfix); keeping your Email content PRIVATE with SSL/TLS Encryption; protecting your Website from HACKERS with FortiGate® Firewalls & FortiGuard®, Symantec® EndPoint Protection, Applicure® DotDefender, SiteLock®, and CloudFlare®… ViUX Cloud Hosting provides a level of protection from all such hazards (and more) to let you focus on running your business. Who? What? When? Where? How? – Having such questions about your Website and its visitors, and not being able to answer them, can be detrimental to your business success. ViUX Cloud Hosting features full Website Log File Reporting via: SmarterStats (Windows); AWStats; Webalizer; Google Analytics; and other tools – so you’ll always have the answers. Cloud Hosting service without SUPPORT is NOT much of a service… ViUX Cloud Hosting features 24 / 7 / 365 Support via Live Chat; Email / Tickets; & Toll-Free Phone. All tickets feature a 1-Hour Response SLA from our staff of EXPERT Web Hosting Technicians. [ DISKSPACE ] is the default amount of SSD Cloud Storage provided for all Websites Hosted within the subscription (Xpress = 10 to 30 or 50 GB & Xtreme = UNLIMITED). Additional Diskspace for the Xpress Plan is $0.50/mo per Gigabyte (GB). Every File / Folder / Database / Email that relates to and/or makes up the Hosted Website(s) uses a certain amount of Diskspace based upon the size and number of such elements. Diskspace can be allocated to specific Websites as desired, as well as, to specific services (i.e. Web, Database, & Email). [ MAILBOXES ] is the default number of Email Accounts provided for all Websites Hosted within the subscription (Xpress = 10 to 20 Mailboxes & Xtreme = UNLIMITED). Additional Mailboxes for Xpress Plan are $0.20/mo each. Linux Email is via Postfix with RoundCube Webmail & MagicSpam. Linux-Hybrid & Windows Email is via SmarterMail Enterprise with Cyren® Premium Antispam / Zero-Hour Antivirus & optional Microsoft® Exchange ActiveSync. [ WEBSITES ] is the number of independent Websites that can be created for Hosting within the subscription (Xpress = 1 or 2 Websites with the 2nd being an additional $1/mo | Xtreme = UNLIMITED). Each Website created has independent Webspace, custom resource allocation, separate management and control. [ TRAFFIC ] is the amount of monthly Data Transfer (Bandwidth) provided for all Websites Hosted within the subscription. Every Website visitor and every Email sent or received results in some amount of Traffic. ViUX provides “UNLIMITED” Traffic for our Shared Cloud Hosting, which means that we do not impose a hard limit on the total amount of Traffic used by Websites, Databases or Email; however there is a practical limit to the total amount of simultaneous Data that can be handled by a Shared Server’s Virtual-NIC Card as generated by (X) number of Websites Hosted on that server. Therefore if it is known that a certain Website will have high-traffic needs, we highly recommend Hosting on a Private Cloud Server. Host an UNLIMITED number of Websites, store as much Data, use as many Mailboxes and as much Traffic as you want – as long as you abide by our Fair Usage Policy. None really… Use the resources mentioned as “UNLIMITED” as needed – there are NO limits! Just try to keep your Website(s) well optimized and do not overuse the other system resources like CPU and Memory so as to monopolize the server. These are SHARED Servers… For known high resource usage Websites and Web Applications, we highly recommend (and may require) going with our Cloud VPS offering. We offer UNLIMITED Cloud so that you do not have to worry about incurring unexpected additional costs for using more Diskspace, or creating an additional Website, or needing another Email Account, etc… However, if you are coming in knowing that you have ultra-high resource needs, then a Shared Server is not the right type of Hosting for you to begin with. If you are asking the question if Shared Hosting is right for you, then it is most likely NOT – in which case you should go with our Private Cloud offering. The most common applications that work best on or require Linux are: WordPress; Joomla; Drupal; Magento; PinnacleCart – and many others. The most common applications for Windows Hosting are DotNetNuke (DNN) and SmaterMail.